The Bank said there were "risks of adverse spill-overs to the global economy" from the 23 June vote. It was "increasingly likely" that sterling would fall further - perhaps sharply - in the event of a leave vote, the Bank added. Vote Leave's Andrea Leadsom said the comments risked financial stability. Sterling fell throughout the afternoon, down around 1.3% against the dollar to $1.4016, but gained ground in late trading to $1.4152. The pound had fallen against the euro following the release of May's Monetary Policy Committee (MPC) minutes but was up 0.3% in late trading. Its nine members said that a "vote to leave the EU could materially alter the outlook for [economic] output and inflation". MPC members said there was growing evidence that UK businesses and consumers were putting off "major economic decisions" ahead of the referendum, with real estate and car purchases delayed, along with business investments. The Bank said it had contingency measures in place to deal with any fall-out from the referendum result, including the offer of more support to banks and partnerships with other central banks to maintain financial stability. 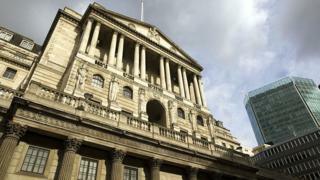 The warning came as the MPC held interest rates at the historic low of 0.5% for another month. Vicky Redwood, chief UK economist at Capital Economics, said a vote to leave the EU would probably mean rates staying on hold for some time, while a remain vote may put a rate rise "back onto the agenda before too long". Howard Archer, chief European and UK economist at IHS Global Insight, said: "On the increasingly questionable assumption that the UK votes to stay in the EU next Thursday, we expect the Bank of England's eventual next move will be to raise interest rates from 0.5% to 0.75% - but not until May 2017." Vote Leave's Andrea Leadsom told BBC Radio 4: "[The Bank's] overriding objective is to ensure financial stability. This intervention is designed to do the exact opposite." "What the Bank of England is doing is rather than saying we have the tools at our disposal to be able to deal with any eventuality, they are instead going along with those forecasts that say there will be some kind of meltdown and there just is not the evidence for that," she added. Earlier, Bank of England governor Mark Carney hit back at critics in the Vote Leave campaign who had warned him about commenting on the Referendum. Anyone thinking that the Bank of England might tone down its warnings on the economic risks of the UK leaving the EU will have been disappointed by today's minutes from the MPC. In paragraph after paragraph, the Bank says "uncertainty" over the referendum is weighing on the economy. It also extends its concerns to global markets - a clear strengthening of its position since the minutes from last month, echoing concerns about "consequences" raised by Janet Yellen, the US Federal Reserve chair. The Bank also says that sterling volatility has increased. There is some better news, however. The Bank does say global growth has slightly improved and that in the UK there has been strong retail sales growth and a "sizeable jump" in industrial production and construction output. But the overall tone is clear - the biggest risk to the UK economy is still the outcome of the referendum on 23 June.